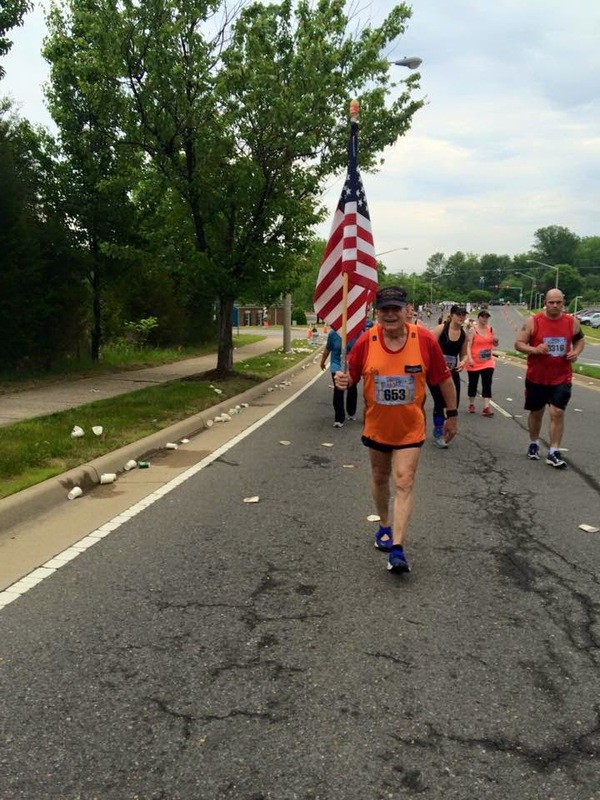 The Marine Corps Historic Half was held this past Sunday in Fredericksburg, Virginia. 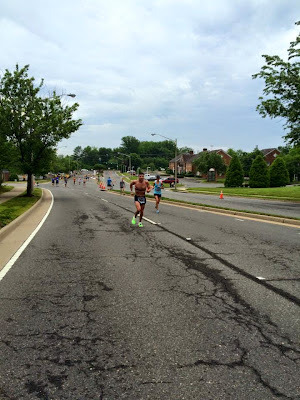 I ran it once (in 2012) and even though I had no other races planned for that weekend this year, I waffled on whether or not I wanted to run it. Then the race sold out and it was clear that I would not be running. As race day drew near, the weather was forecasted to be hot and muggy. Not the best running conditions. I decided to go down and spectate, and hand out popsicles. I hate getting up super early on weekends. If I don’t have a race or a run planned, I’d rather be sleeping until 9 AM or so. 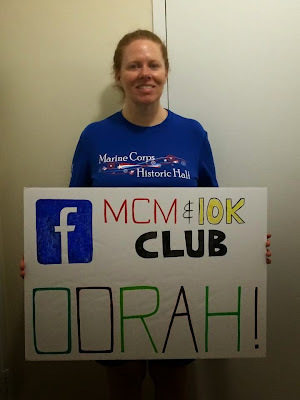 In order to guarantee I’d stick with the plan to spectate at the Historic Half, I used Facebook to hold me accountable. I told members of my “Marine Corps Marathon and 10K Club” Facebook group that I would be there with popsicles. No going back on my word after that! 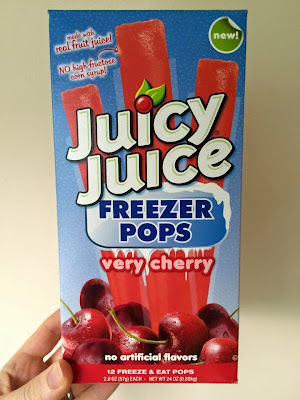 I thought it would be nice to take juice pops that were a little better than the standard high-fructose corn syrup fare. Sure, they would still have cane sugar, but also some real juice. I got several boxes of different flavored juice pops and filled the freezer with them. Unfortunately, it was too much work for the freezer to freeze them all in the time I gave it (15 hours). On Sunday morning, before I headed south to Fredericksburg, only about ¼ of the juice pops had frozen. I drove to Fredericksburg anyway, found a Walmart, and bought a bunch of red, white and blue pops. They may not have been as healthy, but they were frozen! Tried to go with these, but they didn't all freeze in time. After the cooler was stocked, I set out to Hospital Hill to find a prime spectating spot. 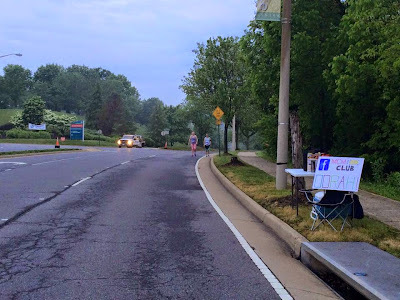 I set up just past the Mile 10 water station, across from the hospital entrance. I took photos of my “popsicle station” and posted them to my Facebook group so people would know where to find me. 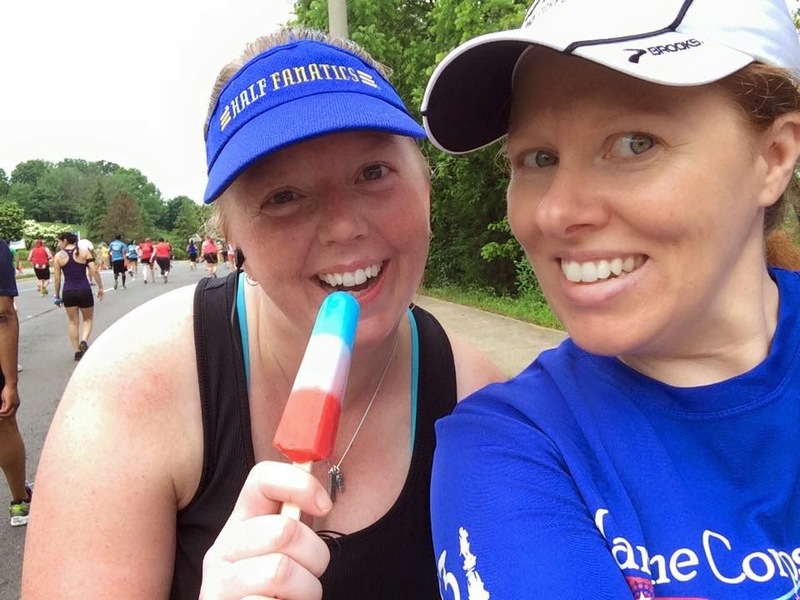 They’d have to ask for the popsicles, because I couldn’t advertise them to all the runners. I didn’t have enough for the thousands of runners; just for my group. In addition to the popsicles, I also brought Twizzlers and cheese balls. I set those up on my table and was happy to share them with everyone. 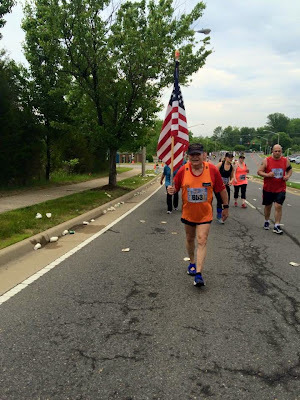 It wasn’t too long after I was set up, and still drinking my coffee, that the 5K started. 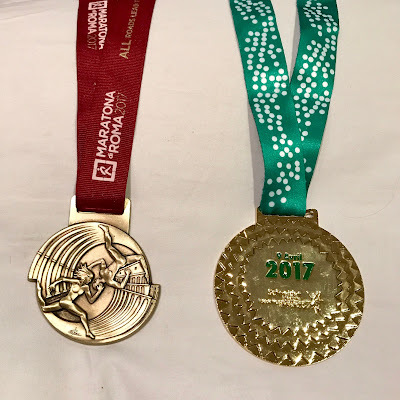 It had a different starting location than the half marathon and the 10K. I saw the 5K runners very shortly after their start. I cheered for them, and for the 10K runners who followed a little later. Most of these runners didn’t take any of my goodies. A couple of the 10K runners were members of my group, so I handed out one or two popsicles. And then the half marathoners started running by. The fasties had no interest in stopping for my treats, but I cheered for them anyway. I saw Chuck Engle and got a sweaty hug from him. 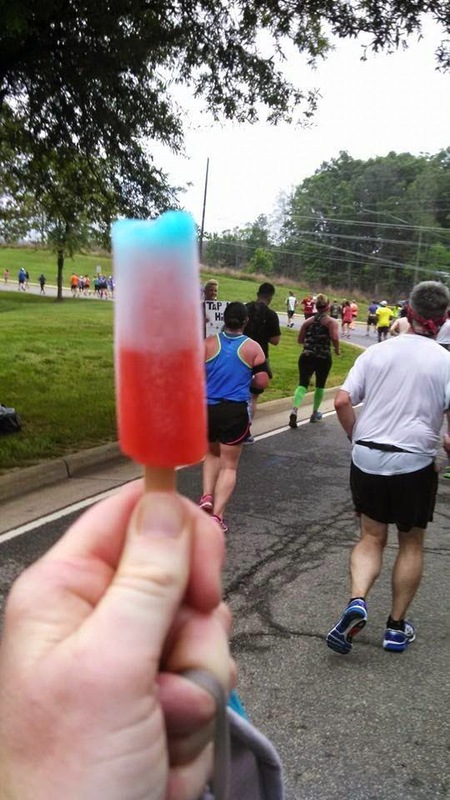 And then the faster of the mid-pack runners started to arrive, and that’s when my popsicle duties really kicked off. I started seeing runners from my Facebook group! They saw the cooler and knew to ask for the popsicles. I met so many new people, but I know I’m not going to remember all their names. I was so happy that I could provide a little something cold and refreshing to help them up Hospital Hill. Pam found me and the popsicles! In the second half of the pack I eventually ran out of the red, white and blue pops, but the few frozen juice pops were at the bottom of my cooler, and they lasted until the very last walkers were coming in. I actually had to find people to give away the last few juice pops. This means I had brought enough for everyone in my group who spotted me on the course, and who wanted one. The Twizzlers didn’t last. I should have bought more of those. The cheese balls found a few customers, but mostly they were unwanted. I think they would have gone over better during a full marathon, or if the weather had not been so hot. 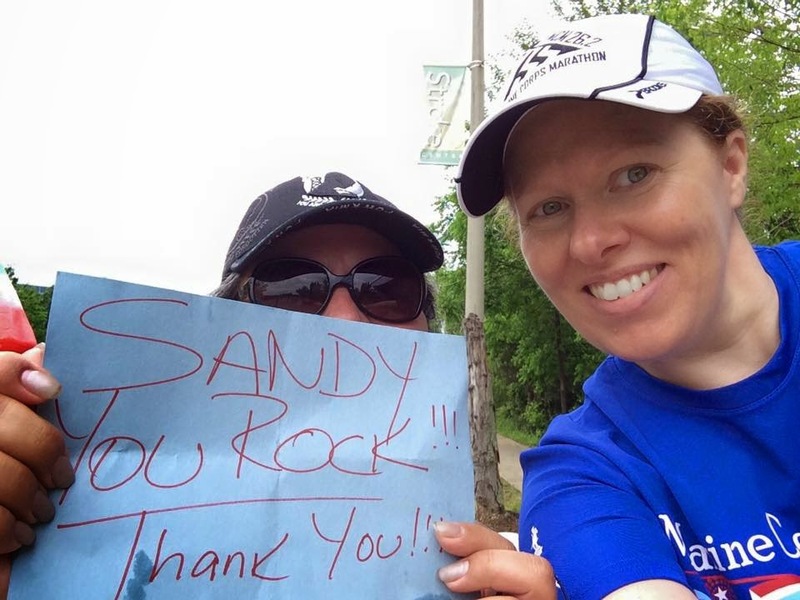 At this race, people wanted fluids, cold things, and sugar. Even though they had -just- been through an official water station, runners were asking me if I had water or Gatorade. I didn’t have any, of course. 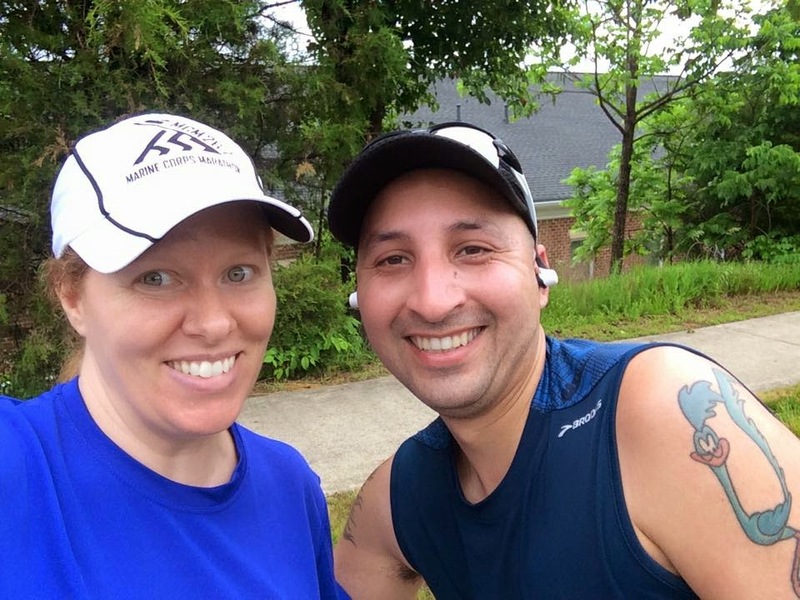 I really felt for those runners suffering through that heat and humidity. Awesome sign from one of my group members! I hate it when spectators leave before the back-of-the pack runners and walkers come through. I hate it when there are no more treats left for those folks, because sometimes I am one of those folks. So, I made sure to stay for the entire race. 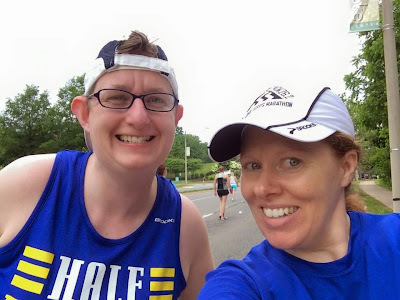 I was out of Twizzlers for the last ¼ of runners, and I was out of popsicles for the very last walkers, but I still had cheese balls (something, at least) and I still stayed out to cheer. A few people saw the cooler and asked for ice cubes; I was able to provide those. I broke down my table after the last person went through. And then I saw something pretty amazing. I witnessed a feat of military efficiency. 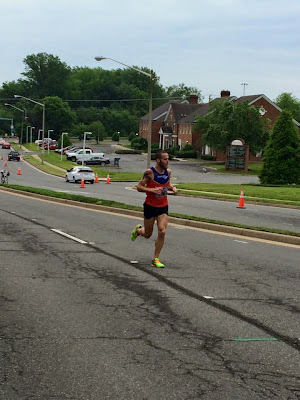 I’d had my eye on the water station during the last minutes of the race. The Marines started sweeping up the cups and breaking down some of the tables when the pack thinned out, but they stayed open and still had water for the last participants. From my vantage point, I saw a still-functional aid station throughout the race. 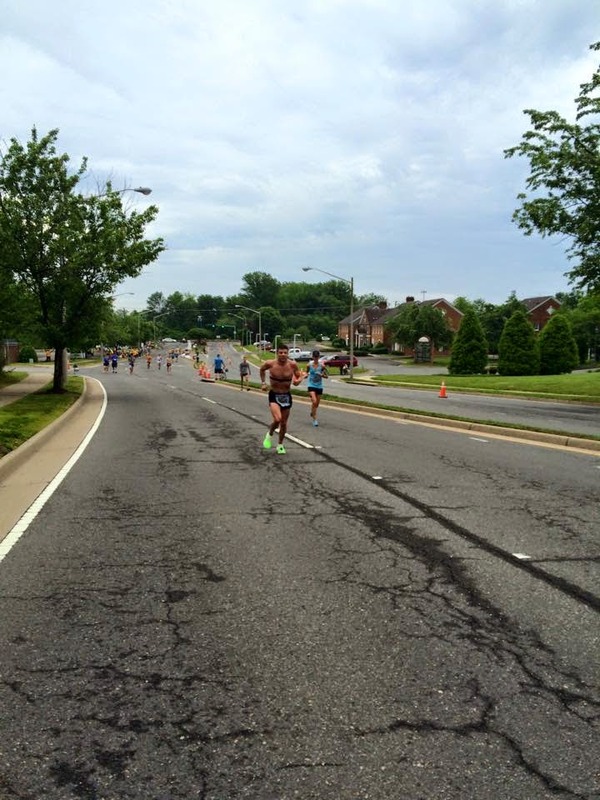 Then I took my first batch of gear to my car, turning my back on the aid station. When I returned, just a few moments later, the aid station was gone! They’d broken down the last tables and loaded them into the truck basically while I blinked! As I carried my second load to my car, the trucks of supplies and buses of Marines drove past me. There was no trace left of the aid station! The tables and trash were gone. The people were on the bus. The road was now open. Only one truck remained, and it was the vendor who was picking up the orange cones. I don’t know how those Marines broke down a whole aid station faster than I broke down my own little camp containing only one small table, one folding chair, one cooler, one bag of gear, and a sign. Impressive! I drove home and immediately crashed. No, I wasn’t exhausted from running. But getting up at 4 AM to spectate wore me out and I needed a nap. Later on, I checked out Facebook and saw many messages of thanks for being out there, for providing popsicles and Twizzlers. I was glad I had done it. And then the photos started coming in. There were selfies of runners with me, photos of popsicles, and also official race photos of runners with their popsicles. Apparently there was a photographer shortly after my popsicle stand. Awesome, awesome, awesome! 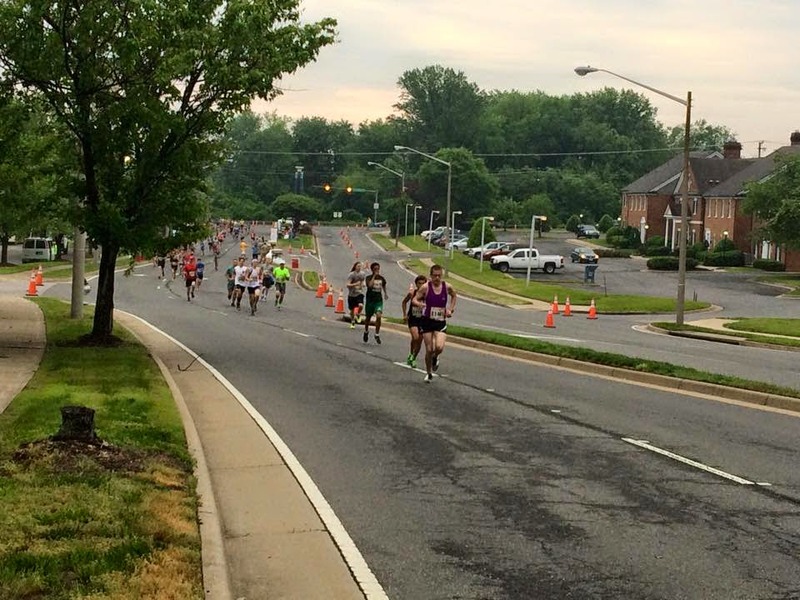 Congrats to everyone who ran the Historic Half in those tough conditions!